Steve Trevor, Steve Howard (née Trevor), Steve Trevor, Steve Trevor, and, you guessed it, Steve Trevor. Image: Harry G. Peter, Jose Delbo, Ross Andru, Chris Wozniak, Nicola Scott, and Romulo Fajardo Jr. (DC Comics), Photo: Warner Bros. Yesterday morning we got our very first look at Patty Jenkins’ next DC movie, Wonder Woman 1984—and learned that somehow, Chris Pine’s Steve Trevor will be appearing in the movie, despite his rather explosive exit in the first film. But it’s not really the first time Wonder Woman’s most famous love interest has cheated death. In fact, being reworked and rebooted—or given some very weird, time-bending familial lines—is sort of Steve’s thing. Although in several incarnations his background in the military has stayed the same (he started out in Army Air Corps Intelligence in the Golden Age, before being an Army Major for much of the Silver Age), early on there were actually several versions of Steve in Diana’s life. After Wonder Woman briefly gave up her powers to be with him in the ‘60s, the original Steve Trevor was killed off in 1969. Almost a decade later, Steve was resurrected as a brown-haired man named Steve Howard, but that lasted only a year—before it was revealed that this Steve was actually the god Eros, who’d inhabited Steve’s body after seeing Diana’s grief over his death, leaving Steve to “die” a second time when Eros was removed from his body. That’s not even the weirdest stuff that happened to Steve in this period, either. 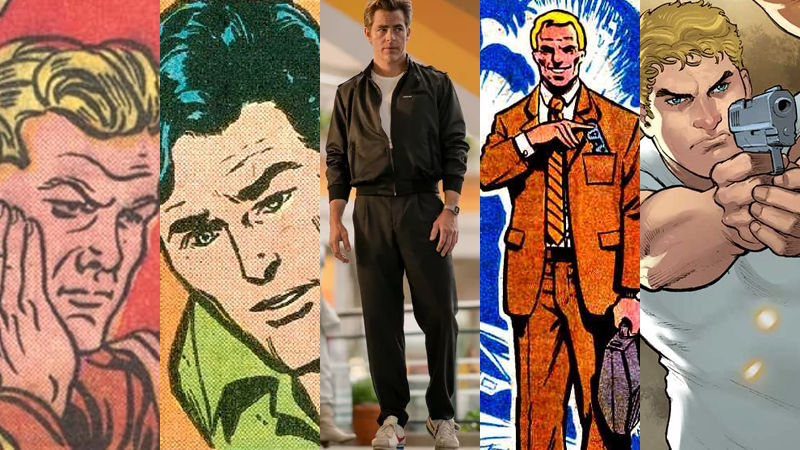 In 1980, writers brought Steve back a third time, in the most convoluted way possible—a Steve Trevor from a different world in DC’s vast multiverse crashed through the barriers between realities and onto “our” Paradise Island. The goddess Aphrodite decided that, in order to make a still-grieving Diana feel better, she’d wipe the memories of everyone on the planet, including the new Steve, so they’d forget Trevor’s earlier deaths and Diana’s relationship with him, and Diana would have a free slate to unite with this latest version of Steve. Diana meets Steve again for the very first time in Wonder Woman #271. Yeah. Oh, and then Aphrodite, for good measure, wiped Alt-Steve’s memories entirely and transplanted the memories of the original, twice-dead Steve into him, kinda restoring the original to life once more. The good news is that none of this technically matters in the scheme of things, as it was all swept away just a few years later when Crisis on Infinite Earths completely rebooted continuity. The new Diana had a closer legacy with Steve’s mom, who crash-landed on Themiscyra in the past and made a heroic sacrifice that inspired Hippolyta to name her own child Diana. The Steve of the Post-Crisis world was actually much older than the previous Steve, and while he and Wonder Woman became friends and allies, they didn’t develop a romantic relationship—instead, Steve retired from military service and married his former assistant (and friend of Diana’s), Etta Candy. None of that matters now either! In 2011, DC rebooted its continuity once more with the arrival of the New 52—this time, Steve was a young man again, but he was a US Navy Seal turned agent of ARGUS, a government group tasked with supporting and researching the superhumans of the USA. Although he worked closely with Diana, they were once again not involved romantically—at the time she was dating Superman. But even that has been switched up once more with the advent of another of the publisher’s updates, DC Rebirth, which has seen Diana and Steve pursue a romantic relationship again in the wake of the New 52 Superman’s death (it’s... god, it’s a long story. A really long story). Diana and Steve rekindling their romance on the cover of 2016's Wonder Woman #9. Poor Steve has been through a lot, as you can see—and the comics offer plenty of weird and wonderful ways to potentially bring him back to life in the upcoming movie. But Wonder Woman 1984, if it’s not simply handwaving Steve’s return from death through other means, could be borrowing a page out of another adaptation rather than the comics: the beloved 1975 Wonder Woman TV show. Starring Lynda Carter, the Wonder Woman show ran for three seasons, but it’s actually split across two different time periods: season one was set during World War II, and saw Diana team up with Steve Trevor, a USAF officer played by Lyle Waggoner, to fight the Nazis. But seasons two and three transplanted the show to the modern era of the ‘70s... except Diana still teamed up with Steve Trevor, a USAF officer... still played by Lyle Waggoner. They weren’t the same character, despite the fact they fit the exact same role in the show and were both played by Waggoner—they were father and son, which is juuuust enough of a stretch to explain the uncanny similarity. Some say we grow up to be our parents, but in Steve Jr.’s case, it was literal! Steve Trevor, and, err, Steve Trevor, as they appeared in Wonder Woman. It’s possible that, as an homage to the show, this could be how Wonder Woman 1984 brings Pine’s version of Trevor back—given the disparity between 1918 and 1984 however, it’s probably original Steve’s grandson, rather than his son. It wouldn’t be the first homage to the TV show we know of—director Patty Jenkins and Carter have both expressed desires for the beloved actress to make a cameo appearance in the sequel, and new set photos from filming have revealed Diana wearing a getup that feels like a callback to the TV show’s fashion sensibilities. We’ll have to wait and see how Wonder Woman 1984 handles it—so far, all we know is that Pine is indeed back for the sequel as a man who looks exactly like Steve Trevor. But whatever the film ends up doing, it’s got plenty of inspiration from Wonder Woman’s past to rationalize his return.